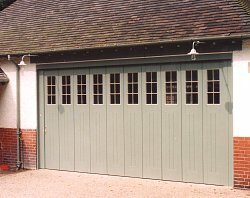 Round the corner garage doors were one of the earliest types of garage doors to follow the side hinged type of garage doors first used. Sliding on different types of top hung rollers with guides commonly running in a U channel set into the ground, the doors are able to be manufactured to almost any size from various types of timber. However the bottom channel was the weak point in the operation as it regularly filled with leaves, gravel and all types of debris which unless cleared out would upset the sliding operation of the door. 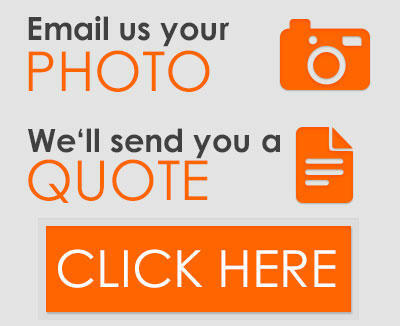 Although today you can still buy the necessary hardware to enable assembly of a traditional round the corner door, the time spent installing combined with the expense of having door panels made by a joiner makes it an expensive package indeed. Remote control automation of the system is also very difficult, if not impossible in many cases and when achieved is very difficult to obtain compliance with newer regulations on anti finger trapping and obtruction detection safety. Now however, there is a solution in the U.K. from one of two German manufacturers - Rundum Meir and Vertico by SWS U.K. Both door types have a bottom tracking sytem which is installed onto the finished garage floor surface and acts effectively as a weather bar (not a weather trap!) as well as not being affected by dirt, dust and gravel. Rundum Meir produce two main types of round the corner system and have done since 1968 - the Original Rundum Meir and the Side Sectional door. 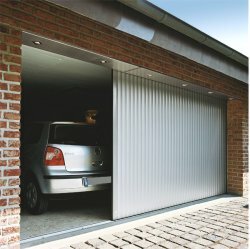 Both door options can be produced in either timber or galvanised steel sections. Either system can be automated very easily and safely with full CE compliance. The timber types available include Norwegian Spruce, Superior Spruce, European Oak, Larch, Iroko, Mahogany and Douglas Fir. 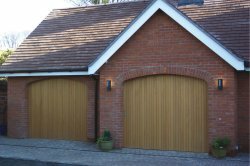 The Vertico garage door is a remote control double skinned aluminium round the corner system with a vast range of finished paint and laminate woodgrain finished colours. Available up to 5800mm wide and 3000mm high in one single door and larger if 2 doors are used in a bi-parting arrangement. 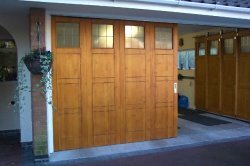 See our Features Page showing both door types in more detail or call one of our branches for further details and pricing.